In probability theory, an event is a set of outcomes of an experiment (a subset of the sample space) to which a probability is assigned. A single outcome may be an element of many different events, and different events in an experiment are usually not equally likely, since they may include very different groups of outcomes. An event defines a complementary event, namely the complementary set (the event not occurring), and together these define a Bernoulli trial: did the event occur or not? Typically, when the sample space is finite, any subset of the sample space is an event (i.e. all elements of the power set of the sample space are defined as events). However, this approach does not work well in cases where the sample space is uncountably infinite. So, when defining a probability space it is possible, and often necessary, to exclude certain subsets of the sample space from being events (see Events in probability spaces, below). 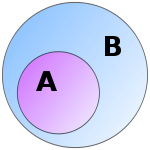 An Euler diagram of an event. B is the sample space and A is an event. By the ratio of their areas, the probability of A is approximately 0.4. This rule can readily be applied to each of the example events above. Defining all subsets of the sample space as events works well when there are only finitely many outcomes, but gives rise to problems when the sample space is infinite. For many standard probability distributions, such as the normal distribution, the sample space is the set of real numbers or some subset of the real numbers. Attempts to define probabilities for all subsets of the real numbers run into difficulties when one considers 'badly behaved' sets, such as those that are nonmeasurable. Hence, it is necessary to restrict attention to a more limited family of subsets. For the standard tools of probability theory, such as joint and conditional probabilities, to work, it is necessary to use a σ-algebra, that is, a family closed under complementation and countable unions of its members. The most natural choice is the Borel measurable set derived from unions and intersections of intervals. However, the larger class of Lebesgue measurable sets proves more useful in practice. In the general measure-theoretic description of probability spaces, an event may be defined as an element of a selected σ-algebra of subsets of the sample space. Under this definition, any subset of the sample space that is not an element of the σ-algebra is not an event, and does not have a probability. With a reasonable specification of the probability space, however, all events of interest are elements of the σ-algebra. ^ Leon-Garcia, Alberto (2008). Probability, statistics and random processes for electrical engineering. Upper Saddle River, NJ: Pearson. ^ Pfeiffer, Paul E. (1978). Concepts of probability theory. Dover Publications. p. 18. ISBN 978-0-486-63677-1. ^ Foerster, Paul A. (2006). Algebra and trigonometry: Functions and applications, Teacher's edition (Classics ed.). Upper Saddle River, NJ: Prentice Hall. p. 634. ISBN 0-13-165711-9. Wikimedia Commons has media related to Event (probability theory). Formal definition in the Mizar system.